There is no mention of a church for Edingley in Domesday Book; it is likely to date from the 12th century and is Grade II* listed. 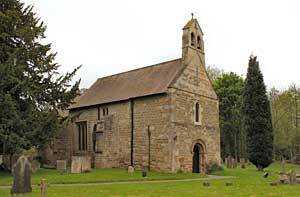 The building is situated in the middle of the small village of Edingley near Southwell, and today consists of a simple form of nave and chancel with a turret with two bells, one probably 14th or early 15th century, though it formerly had a small west tower. The church appears, for much of its life, to have been a prebend of Southwell Minster and thus fell under its influence as part of the Peculiar. Archbishop Herring's Visitation Returns of 1743 recorded 'Eddingley' as one of a number of parishes that had made no Return to the Archbishop. A 1773 sketch shows a view from the north of the church in open land with a north porch, flat roof with parapet and wooden top to a west tower. The church has undergone many changes over the years, with the chancel being rebuilt in 1844 and extensive rebuilding and reordering works in the 1890s. and to him and Chris Brooke for the photographs.